No Shot® B-12 “MicroLingual® Instant Dissolve Tablets” go to work fast, just place one tablet under the tongue and dissolves within seconds and the nutrients are sped into the bloodstream. Vitamin B-12 provides essential nutrients for the well-being of the heart. The combination of vitamins works synergistically to help lower homocysteine levels, lowering the risk of developing heart disease as well as providing nutritive support for healthy cardiovascular functions. Vitamin C is an essential nutrient that cannot be produced by the body, therefore, it must be replenished daily. Vitamin C has several beneficial purposes including developing and maintaining healthy skin and bones, to form collagen and also enhances the absorption of iron from plant-based foods we eat. Vitamin C also provides support to the body's immune system. Superior Source Vitamin C 500 mg, “Tangy Orange Melts”, utilizes sodium ascorbate, which is a buffered (non-acidic) form of C that does not contribute to gastric irritation. NO sugar added; only sweetened with a little stevia. This is preferable to most “chewable” vitamin C products that typically are loaded with lots of sugar. A POWERFUL CALM - Find your L-theanine serene with these tiny dissolvable tablets. Our premium L-theanine promotes relaxation, brain calm, anxiety relief, and facilitates restful sleep. 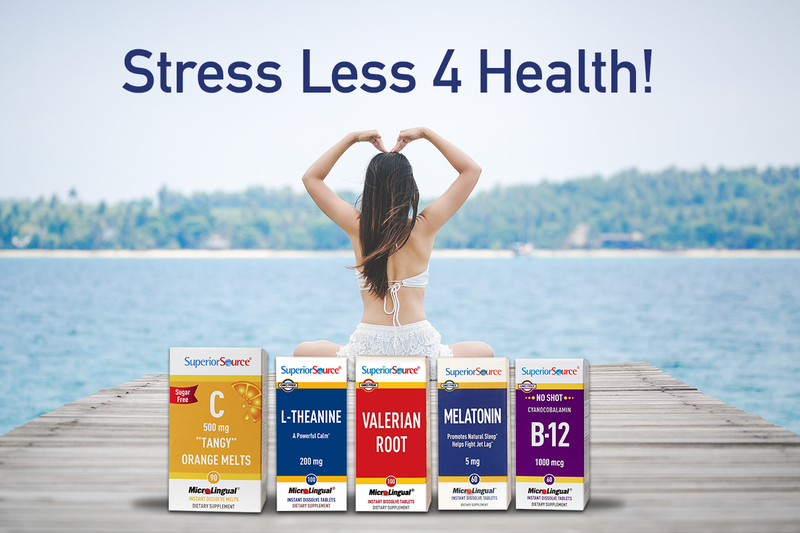 Superior Source’s “Valerian Extract” can be just what you need to help relax after a long day at the office, or with the kids. Valerian can impart a calming effect to put your mind at ease. Giveaway: one winner will win Superior Source Vitamins as described above. $85 value! disclosure: free products to review. I feel it is important to take vitamins and would try this brand if I should win this.